Two footballing stars have met while on holiday...with PNE's Callum Robinson introducing himself to Liverpool's Mo Salah. The North End forward has been on a short break in Dubai while he steps up his recovery from hamstring surgery. While in the United Arab Emirates he bumped into Egyptian Salah, Liverpool without a game at the weekend after being knocked out of the FA Cup by Wolves. Robinson posted a picture on social media after the encounter and we're sure Salah was delighted to meet one of his heroes as well! 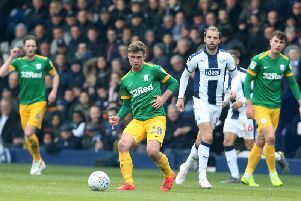 PNE's Republic of Ireland international is expected to return to action in March, a flying start to the season that saw him hit 10 goals having been brought to a halt when he limped off in the big win against Blackburn back in November. Before heading on holiday Robinson further endeared himself to North End fans by buying a ticket to take his place in the away end for the 4-1 win at Queens Park Rangers.